Mor liked to tear a book apart as he read it, breaking the back, thumbing and turning down the pages, commenting and underling. 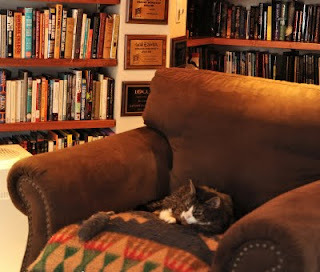 He liked to have his books close to him, upon a table, upon the floor, at least upon open shelves. Seeing them so near and so destroyed, he could feel that they were now almost inside his head. The Kindle and other e-readers have received an obsessive degree of attention in the press this year, with some people declaring the Kindle a great leap forward (see Jacob Weisberg in Slate) and others saying it's not nearly as good as a book. Nicholson Baker test-drove one for The New Yorker and found it disappointment: the screen "wasn’t just gray; it was a greenish, sickly gray. A postmortem gray." I'm a little surprised that so far, all the commentary I have read both pro and contra e-readers has focused almost entirely on the reading experience. Most people agree that a printed book--especially a well-designed, well-printed one--is more pleasurable to read, but Kindle partisans love the convenience of carrying many books in a one-book-sized package, not to mention the instant availability of so many titles. I was a Kindle early adopter and I can still remember the first time, stuck in an airport lounge, I zapped a book into my hands out of the ether. It felt like something out of Harry Potter. But as any book lover knows, the act of reading a book is only part of your experience of it. You have a relationship with the volume itself, not just with the text it contains. And the physical book, in fact, becomes the symbol of that relationship--in the precise sense that it partakes of what it signifies. When I sit in my armchair and look at my bookshelf across the room, the spines of each volume I've read summon up memories and sensations just as if I were going through a photo album. When I think of books I have loved, what comes to mind is not disembodied words, but the actual books. I can remember the way the type lay on the page, the feel of paper and binding in my fingers. But the intensity of my feeling for certain books isn't the product of their aesthetic quality--my disintegrating, shoddy paperback of Le Grand Meaulnes is just as numinous as four elegant hardcover volumes of Virginia Woolf essays that I have preserved much more carefully. I have always felt slightly disappointed in myself as a reader because I treat books rather gently, unlike Iris Murdoch's Mor, who ravages his books in the course of reading them. It is only by almost destroying the printed pages that he gets them "inside his head." This passage captures something primal about how, in an almost literal sense, we consume writing. You can't consume an e-book quite the same way. Don't get me wrong: I think my Kindle is great--and reading Kindle books on the iPhone, which I can carry in my pocket, is even better. For me, it's not while I read them, but afterward, that e-books fall short. Not only do I remember that magical moment in the airport lounge. I also remember when I turned, or rather clicked, the last page of my first Kindle purchase. Suddenly the book was gone--vanished back into the ether. Perhaps possessing books "in the cloud" alone is a purer way of appreciating literature. But I hope I will not be accused of Luddism or fetishizing print if I say that much as I love my Kindle, the satisfaction of closing a wonderful book and slipping it into a shelf in my library, where I can enjoy its company, will never be equaled by the satisfaction of watching a screen go blank.